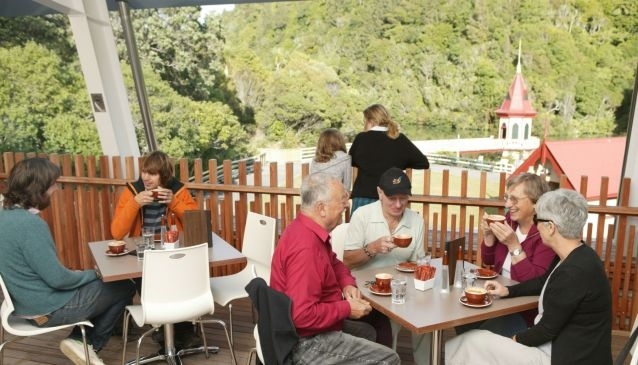 Head to the second floor of Zealandia's Visitor Centre to experience Rata Café, which boasts some of the best vistas in Wellington. Sit and enjoy some beautiful views of the lower lake as you dine on delicious menu options, sandwiches, homemade cakes and healthy juices. At Rata Cafe, customers can choose from a wide variety of sumptuous counter food and quality picnic bites, together with an enviable choice of beers and individually-selected boutique wines. Kids are well-catered for with their own menu, and there are plenty of high chairs for the toddlers. You can also hire Rata Cafe for your own private occasions, anything from birthdays and weddings, to corporate events. Rata Cafe is committed to supplying free-range meat and dairy, and all their fruit and veg are locally-cultivated and always seasonal. Even the coffee is fair trade, and the milk is organic, and as if that isn't impressive enough, it's good to know that they use biodegradable packaging and eco-friendly cleaning products. Feel good in the knowledge that you're helping the team at Zealandia spread their green message. Every cent of profit from Rata Café goes straight back to the Karori Sanctuary Trust, to help them continue all the good work at Zealandia. They have a 500-year plan, after all, so every little helps! Please visit Rata Café to view the latest menu options.